In a recent report published by the New York Federal Reserve Bank, student debt in America now totals $956 billion in outstanding loans. Consequently, the delinquency rate on student loans in 2012 was higher than any other type of consumer loan, which includes credit cards or auto loans. In the same year, the average student loan balance was $23,000, a 4,000-dollar increase since President Obama took office in 2009. One might say, “So what” when presented with these statistics, but the current state of America’s higher education should not be overlooked. Modern day students are paying never before seen tuition prices for higher education and these statistics demonstrate that the current system is severely flawed and in dire need of reform. These statistics also illustrate that students enrolled in higher education are seeing their tuition bills skyrocket to astronomical levels with no proposed relief in the temporary future. Under our current education system and the changing nature of our economy, modern day students need to have a college degree in order to be competitive in the workforce. Students are thus forced to obtain a loan to pay for their degree, one that they may have difficulty paying off upon completion. The consequences of not repaying one’s student loans are significant: government can take up to 15% of a borrower’s wages, Social Security disability and Social Security retirement income. Collection charges of up to 20% can turn a 10-year loan into a 19-year loan, and the failure to repay the student loan will have a lasting effect on the borrower’s credit score, which will prevent them from getting an auto loan or mortgage. For those who earlier thought “so what,” how about the idea of someone you know not being able to afford getting their car or mortgage? The federal government, which holds roughly 85% of the outstanding student debt and finds itself burdened by billions in unpaid student loans, has offered a few options to those who cannot afford their monthly payment. These options include deferment, forbearance, and reductions in monthly payments. However, the above listed options are not available to those who find themselves currently defaulting on their student loans, thereby making it difficult for many to pay the government back. To combat this major problem in the higher education system, President Obama’s solution is to get borrowers off the subsidized Stafford loan program and have them enroll in the Income Based Repayment (IBR) program. In 2010, President Obama signed into law an improved income-based repayment plan that would lower the previous discretionary income cap for students who take out loans after July 1, 2014 from 15 percent to 10 percent. Then, last October, the President announced an executive action to make that lower cap available to more borrowers by the end of 2012, rather than 2014. Despite likely reducing monthly student loan payments for more than 1.6 million responsible student borrowers, according to Chad Miller, the director of education policy at the American Action Forum, the IBR is an expensive alternative and a potentially costly solution. According to the White House’s fiscal year 2013 budget, the subsidy cost (cost per dollar loaned) for loans in IBR is substantially higher than the costs of subsidized Stafford loans in any other repayment plan. Essentially, if the government moved away from subsidized loans, it would shift the student loans to unsubsidized loans, which immediately saves the government money – close to $2.7 billion since the government does not subsidize these loans. However, once these unsubsidized loans shift into the IBR system, it would cost the federal government $1.5 billion. Obama’s rush to usher in more generous IBR terms will result in the government digging a $50 billion hole in the next ten years. More government debt would have an adverse effect on other forms of financial aid, like Pell Grants. This would be an utter educational tragedy, as the Pell Grant gives funds to students from very modest means to help them mitigate the increasing tuition prices of higher education in America. With close to a trillion dollars of student debt on unpaid loans, the current financial aid system is in need of major reform, but the necessary higher education reform that is required is not on the forefront of anyone’s agenda. Despite the fact that Moody’s Investors Service recently downgraded its outlook for the higher education sector across the board. This is a result of higher education institutions continuing to increase their tuition cost at the same time American family’s net worth declined by as much as 39% within the last three years. According, to former U.S. Secretary of Education, William Bennett, the more money the federal government hands out to students, the likelier the price of higher education tuition increases. With the federal government backing and handing out roughly 85% of student loans, the price of higher education has ballooned to record levels, which has placed the federal government in a potential disastrous position. The government’s decision to shut out private lenders for the most part means the federal government has assumed the responsibility for collecting payment. But when there is close to a trillion dollars of student debt on federal cut loans, the question now becomes where is the government going to recover that amount and what programs are they going to cut in order to make up the difference. Education is the key to the success of any society, but what does the current student loan default crisis illustrate about the current state of America’s higher education system. It indicates that a majority of students are financially unable to repay their student loans resulting in these students living with a constant burden that affects their future success. It is the hope of current and future student borrowers that policy makers on Capitol Hill can come together on the issue of higher education in order to produce real reform of the modern student loans crisis. 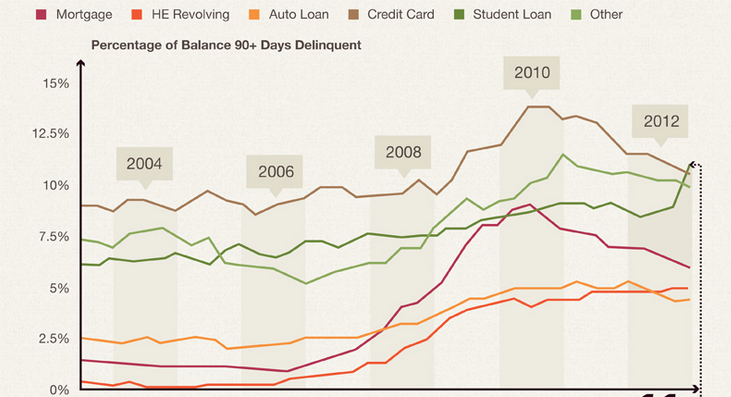 Full Student Loan Infographic available here. Tags: Barack Obama, college, Debt, Education, Moody's Investors Service, New York Federal Reserve Bank, Obama, Pell Grant, Pell Grants, Stafford Loan, Student loan, Student Loans, Student loans in the United States. Bookmark the permalink. Previous post ← Why are Cuban Americans unhappy with Chuck Hagel’s nomination?